Ankh is a symbol of the sunrise, with the loop representing the Sun rising above the horizon, which is represented by the crossbar. The vertical section below the crossbar would then be the path of the sun. The Ankh is also known as key of life, the key of the Nile or crux ansata (Latin meaning "cross with a handle"), was the ancient Egyptian hieroglyphic character that read "eternal life". Egyptian gods are often portrayed carrying it by its loop, or bearing one in each hand, arms crossed over their chest. The Key of Life (Ankh Key) is also the key to all hidden knowledge which lies within the divine onion of femine (represented by the loop of the key) and masculine (the line below). The union is in the circle (Rainbow Hematite Cirle) of God's glory, his kindness to man, his love and wisdom. This is a symbol of Oneness, Wholeness and Unity. The perfect balance of inner feminine and masculine aspects which reveals the universal wisdom. The symbol itself is 1.5 cms (0.59 inch) from tip to the top and 0.8 cms (0.31 inch ) wide. The necklace is 31 cms (12.20 inches) long. 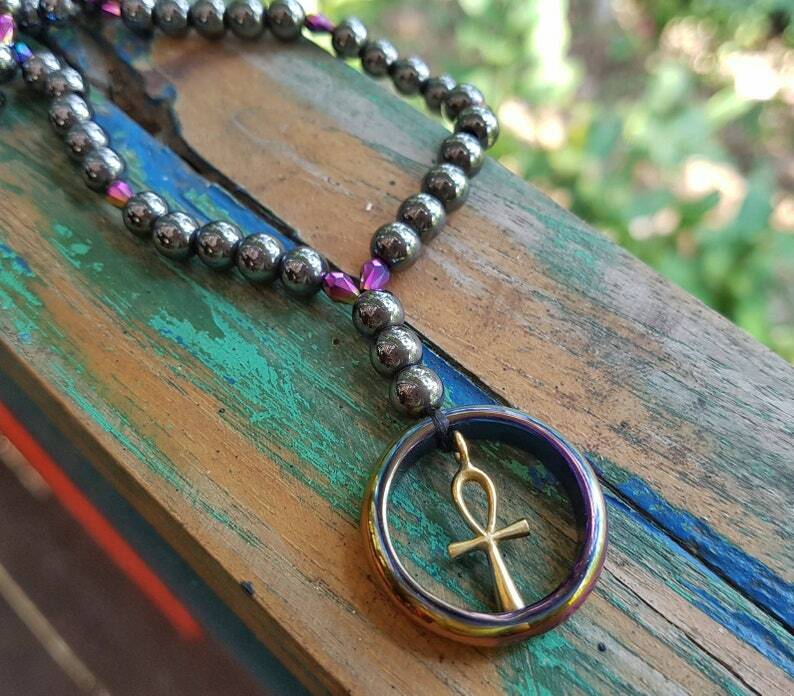 Silver hematite beads, rainbow color beads, rainbow hematite ring, brass Ankh Key.